Welcome to New Roof Plus, Castle Rock CO! 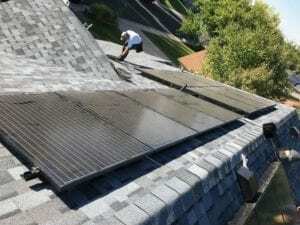 We serve Castle Rock, all of Douglas County including Castle Pines, Larkspur, Sedalia, Perry Park, Castle Pines North, The Pinery, Parker, Lone Tree, Franktown, Highlands Ranch Plus the entire Denver metro area with complete roof replacement and installation. We have replaced roofs all across Castle Rock and the south metro area from the hail storms that hit us throughout this year and last. The motto at New Roof Plus is “Building New Roofs and Relationships” and we work hard to do that every day with every customer. Read our reviews to see what others say about us. While we are a highly rated Castle Rock roofing company and Denver roofing company, we know that every roof replacement we install requires our very best effort, attention to every detail, quality roofing materials and constant communication with our homeowner. Our reviews reflect our hard work in customer satisfaction. The recent hail storms across the Denver metro area and right here in Castle Rock were intense and in some neighborhoods, very destructive to thousands of roofs. We are working every day for our customers and with their insurance companies to help get their Castle Rock home roof repaired or replaced to the pre-storm condition as soon as possible. We are a homegrown Castle Rock Colorado roofing company, serving the entire Front Range from Castle Rock down to Colorado Springs, from Denver to Fort Collins and all points in between. We work on residential home roofs of all kinds and provide you high-quality roofing options – from traditional asphalt roofing shingles for residential roofing to metal roof types and stone coated steel roofing to commercial buildings with complex flat roof systems. If you need a new roof or just need to start with a roof inspection, we are certified at the highest levels in the roofing industry to find and assess any damage. Our teams have seen it all and have the years of experience and knowledge to execute a perfect roof installation. If using the best Castle Rock roofing company is important to you, we are a great choice. Haag Roof Certifications are rare for a Castle Rock CO roofing contractor and they are even rarer when including all of Douglas County and the entire state of Colorado. Taking the initiative to continually learn and become the best in the business is what Greg and the New Roof Plus team are all about. You have many Castle Rock roofers to choose from. We are building the best roofs, with the best quality roofing materials and building the best relationships one customer at a time. We hope to build a great relationship (and maybe a roof) with you too! 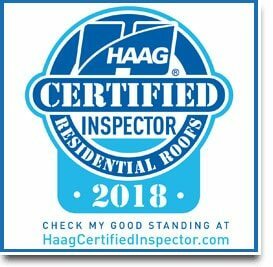 New Roof Plus is also Certified for Commercial Roof Inspections with Haag. If you own a Douglas County area commercial building and you are concerned about the integrity of your commercial roof, New Roof Plus delivers true roofing experts who are certified at the highest level to give you an assessment of your building’s roofing system. A commercial roof and most flat roofs require a special skill set – different than residential roofing installations. Douglas County has seen many new commercial buildings, including booming areas along the I-25 Corridor, Santa Fe and even Wilcox St in downtown Castle Rock, that have sophisticated flat roof systems. A massive hail storm, as we have seen recently, can do substantial damage. If you own a building or manage a commercial building with a flat roof system, you should have it inspected for issues -even if it’s a relatively new building. You want to have someone familiar with building code in Douglas County and Denver CO. Flat roofs are prone to water pools so you want to make sure all water is diverting off the roof as designed. 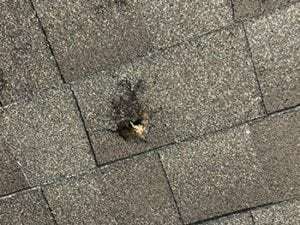 Metal roofing, while many would think it hail damage proof, often is not. New Roof Plus has installed many variations of metal roofing systems on both residential and commercial roofs. If you have a vision of a new metal roof on your Castle Rock home or building, give us a call for a free estimate and brainstorming for ideas and suggestions. To name a few, we work with the following insurance companies: Allstate, Farmers Insurance, Amica Insurance, USAA Property and Casualty, MetLife, Nationwide Mutual, Hartford Financial, Liberty, Travelers, State Farm, American Family, Chubb, Pure Insurance for High Net Worth Properties and many more… These insurance companies know that New Roof Plus are true roofing experts they can rely on in the roofing industry – which is why so many refer their customers to us. We look forward to being your go-to Castle Rock roofing contractor, as well as Douglas County and Denver CO, providing quality products, materials, installations, and service. We serve all of the Denver CO roofing market, Castle Pines roofing market, Parker roofing market, and all the beautiful cities across the Front Range!